Fantastic fishing today. We found lots of herring and mackerel first thing on a sand bank for bait and was used to catch an impressive amout of skate and the odd smoothound. Nice few Plaice inshore for Mr Chapman and crew. Callum flannery from the isle of sheppey with a nice blonde ray which weighed 9lb 8 oz, that was Callum’s first ever blonde ray fishing on board Elizabeth Jane today, well done! Few skate for Mr Beaney and crew on saturday. Had my Plaice rod out most of the day, dropped loads but landed some in the end, best at 40cm and rest over 30cm! Adam from Essex with a 7lb 8oz Pollock, he also had a small turbot later in the day whilst out onboard Elizabeth Jane over the weekend. 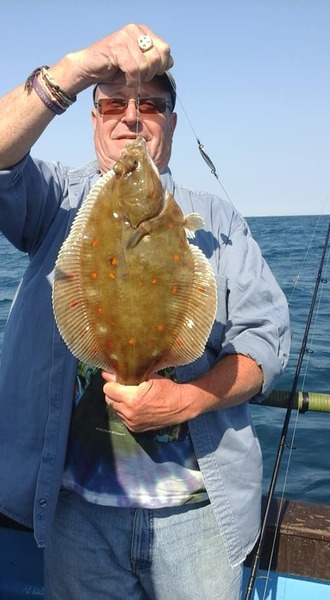 Tom Ottway from Cranbrook with a fine 15lb blonde ray fishing onboard Elizabeth Jane today, the fish put up a terrific fight down tiding on light gear, well done Tom! Kent angler Gary Greenhill with a 9lb Pollock and Essex angler Gavin Lee with a fine 13lb Pollock caught on Elizabeth Jane today! James Miller with a nice 7lber caught on Elizabeth Jane today! Mr Gaunt with a superb condiditon Bass! Clive with a beautiful gurnard caught onboard sea otter whilst enjoying some glorious October weather! Shane and crew onboard today. The skate curse continues for us as our target species was no where to be seen. Lads still had and good day out and enjoyed themselves. Shane had the heaviest skate at 11lb but unfortunatley i have no photo. Here is Ginge with one of his rays. Bexley angler, John Tettmar with some nice Black Bream out fishing on Elizabeth Jane today. The lads also hooked some nice Tope but only landed one, stronger line next time lads! Jack and Chloe onboard today. A rolly start to the day but soon fined away to be a lovely afternoon. Here is Chloe with a superb 10lb Tope caught on a Mackerel strip! Jeff and crew from the Isle Of Sheppey had some nice Bream, they also had Skate, Tope and a strap Congar making up a nice mixed bag for the Kent lads out on Elizabeth Jane over the weekend. Sid Webb and crew from Bexley Heath with a 6lb cod and some nice Black Bream on board Elizabeth Jane today. Day 2, Another fantastic trip with the Collier crew. A Great weekend with a great bunch of guys, A pleasure to have you all on board. Day 1 on the brean and other summer species with the Collier crew! Kent angler Gary Greenhill with a 25lb Tope onboard Elizabeth Jane today, Welll done Gary! Barry and crew onboard having a go at the rays in the shelter of the land! Here is Richard about to land his first ever Ray. Well done mate! Tried for a plaice today, with the Crocken Hill Boy's, the going was slow, with 1 or 2 better ones for Neil and Big Cliff, a number of Dabs, Gurnard and plenty of Greater Weaver! Cliff managed to land a 14 lb Tope on his Plaice gear. Stopped for a few Bream on the way home on the wrecks. Beautiful day to be afloat. 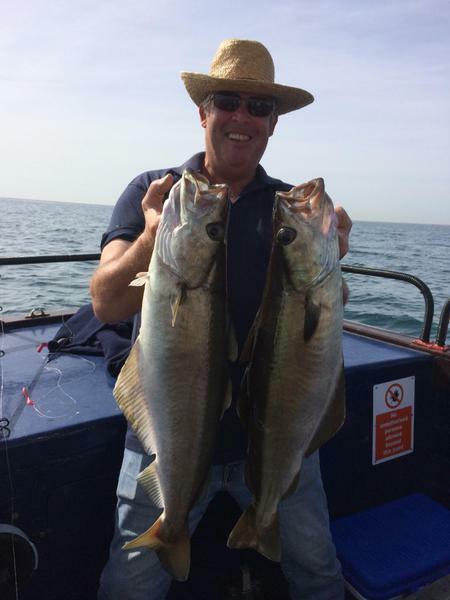 Regular anglers Gavin and Gary enjoying some good sport conger fishing with 5 fish and 3 around the fifty pound mark! They also had some Black Bream onboard Elizabeth Jane today. All eels returned alive. A few bream for Terry and crew. Ken from London with a bonus 5lb Lobster out on Elizabeth Jane today. Shane Beale and crew having a go at the Bream. Chris with a nice Bull Huss out on Elizabeth Jane today. 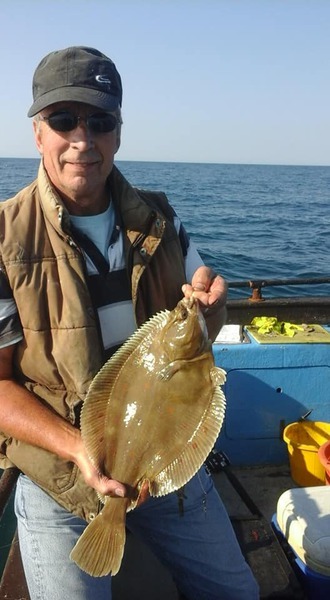 Young Robert on his first boat fishing trip landed this lovely 8lb ray. Well done mate! Rob and crew from North Kent had some good Bream fishing out on Elizabeth Jane over the weekend! A very enjoyable last couple of days with the collier family and Simon Newman onboard! Both days had plaice as the target species. Saturday was thick fog with a sloppy sea from the south west, plaice and greater weaver were boated along with a few scarce mackerel. Biggest fish going to David. Sunday boasted more or less the same fishing with the addition of 5 reasonably sized thornbacks however it was accompanied by bright sunshine, 0 mph winds and water like glass. Biggest fish going to David again! Nice breakfast rolls and steak rolls both days supplied by Mr Newman! Thankyou. All of this weekends antics was washed down with a few beers at the designated debriefing office (Pilot). Today's fun in the sun! Group of lads on today from the south. The best part of being a skipper of a charter boat is seeing someone break their personal best and more so catch their first fish! Below is a picture of Archie from London with his first skate. Well done mate! Fairchance fishing today 01797 363544 Dungeness. 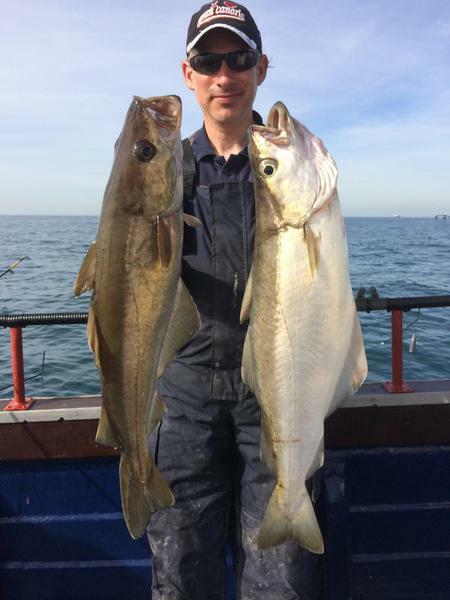 Croydon crew out today, after leaving all their Bait on shore, managed to catch a couple of Mackarel, a nice plump 5 lb 8 oz Turbot for Paul Sarkie, Thornback Ray and a 4 lb Codling also caught. Regular local angler Derek Regan with a nice plump spring cod caught on Elizabeth Jane today. New PB Spur for the skip 17lb+, Fish was photographed weighed and released! Kent angler Gary Greenhill with a nice Pollock out on Elizabeth Jane today! Malcolm and his crew aboard the Sea Otter on a lovely calm day! A few Rays and Plaice was the order of the day. Well done Lads! Derek Regan and his crew from Kent with some nice Cod and Pollock onboard "Elizabeth Jane today. Nigel Beaney and family onboard today. Nice few rays caught! Eddie and crew from London with some nice Pollock onboard "Elizabeth Jane" today. Great day today. A few Plaice inshore and a few other species out on the bank. Foggy start to the day with flat calm seas. Very enjoyable having Becky, Mark, John and Ian onboard. Rays and Plaice made up the bulk of species! Including John with a double shot of Plaice. Thanks for filling the boat at last minute gang! Becky Lee, Simon, Bob and Chris having a good day onboard the "Fairchance". 20 Plaice, 20 Skate and 4 smouthound!! Dave and mike from Kent with some pollock and a couple of codling on board Elizabeth Jane today. George with a 10lb ray! Wet start to the day but cleared up to be the best day ive been at sea in this year. Fishing was much slower but thats how it goes! George had the best ray going just over 10lb. Fairchance fishing today 01797 363544. Ashford angler Larry Harper and his sister Sue, Drifting the wrecks today. 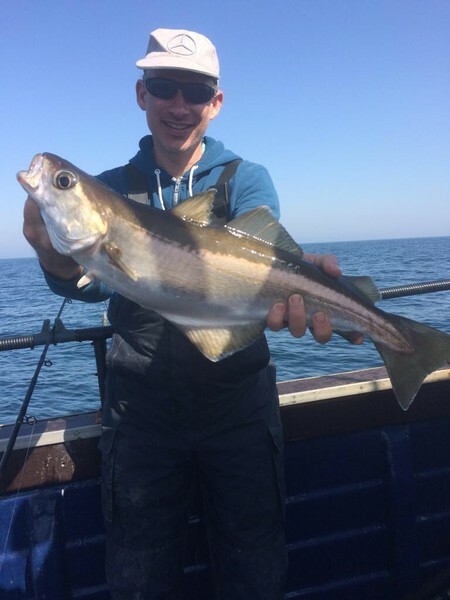 Boated 10 pollock to 5lb and 1 2lb codling, 1 or 2 mackerel starting to show! Shane and crew onboard today. Tried a few wrecks down east with no joy, went closer in and anchored with everyone else for a ray. We had 7 or 8 in total with the biggest going to Shane at 10lb 8oz! Nice ray for Mark today, Unfortunately the trip was taken short due to a couple of other crew being uvercome by sea sickness. James Miller with a nice ray just over 10lbs. A touch of spring in the air at sea today. Few rays, smooth hound and a plaice for Algis and crew. "Elizabeth Jane" was anchored next to us and had 4 smooth hound. Worth fishing with a bit of crab next trip???? Barry and crew from Tonbridge on today. Biggest fish went to George with a 9 1/2lb. Bit of sunshing and calm sea's making a very enjoyable day! Sometimes its best to fish for what is around. Skate fishing can offer easy fun sporting fishing not far from home! 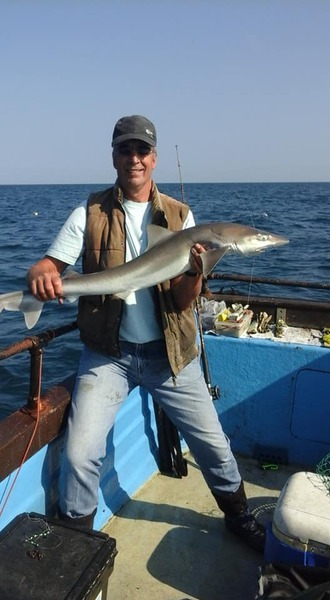 Gavin Lee from Essex with a fine double figure spurdog, which was retuned alive! Steve from Tonbridge Wells with a nice Tub Gurnard! Species hunt today. Think there was about 13 in total, including Codling, Skate, Black Bream, Garfish, Mackerel, Tub and Red Gurnard! Here's Roland with one of his skate! Nathan Levi Smith onboard today landed 2 fine cod! 1 at 17lb and the other going just over 11lb. Phil Edwards also had 1 at 3lb. Sid Webb and crew from Bexley Heath, Kent onboard "Elizabeth Jane" today enjoying some great black bream fishing. Well thought today might be a good time for an experimental Cod trip. Uptiding a few cuttle and dungy lug baits produced 3 Cods, 1 Ray, Few channel whitings and 3 strap Congers. Not the motherload but it is promising to see winter Cod showing on the Dungeness Coast. They're coming! Eddie from Kent with a superb 6lb lobster onboard "Elizabeth Jane"
Steve, Bob and Anthony had a great day on the rays today. Total amount unknown as we through loads back. Anthony who had never caught a skate before now has a personal best of 11lb 2oz. Great day! James Miller and crew from Tunbridge Wells had a good day on the species with a rare trigger fish and some nice black bream. Bream, Mackerel. Codling, Bass, Gurnard, Whiting, Pouting and Horse Mackerel were on the species list today. Not bad for a score of worms each and a set of feathers! 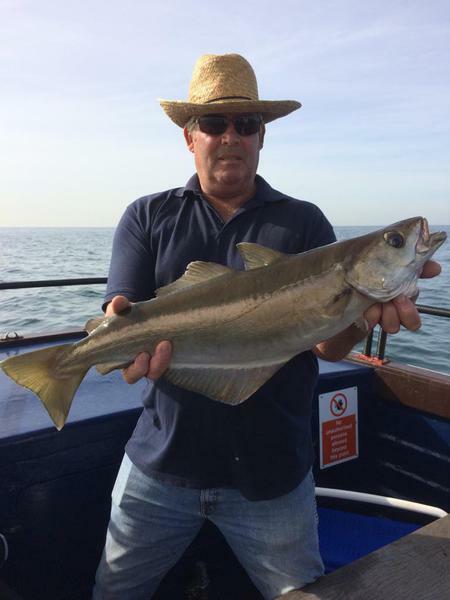 An original Dungeness Allstar Tony Cullam, with an 5 lb Cod, 2 others also caught around the same size, on Cuttlefish up tide, plenty of Bream also caught.